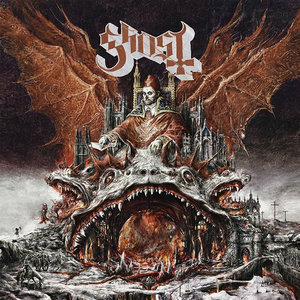 Underneath the catchy melodies and snazzy artwork, Ghost have created one of the cleverest heavy metal records in recent memory. As much as critics like to declare acts as "the next big thing", it often takes longer than anticipated for a band to cultivate a large mainstream following. From the moment Darkthrone founder Fenriz praised the mysterious Swedish band Ghost in 2010 – remember MySpace? – many in the underground metal scene were enraptured by the band's sumptuous combination of 1970s heavy metal, overtly Satanic themes, and inspired art direction. Being on UK metal tastemaker Rise Above Records didn't hurt either, and by the end of the year, the debut album Opus Eponymous easily ranked as one of the most acclaimed metal albums of 2010. For all the hype surrounding Ghost's lucrative signing with Loma Vista, it was nevertheless a slow build. Led by the creepy, papal-inspired Papa Emeritus, the faceless, costume-clad sextet honed its musical chops on the road, working the North American touring circuit especially hard. 2013's dark, murky Infestissumam showed signs of inspiration, but was a commercial disappointment. However, things started to turn in the band's favor two years later. Meliora ingeniously expanded upon the original idea of Opus Eponymous, boasting lavish production, heavier riffs, and a strong sense of theatricality, best displayed on breakthrough tracks "Cirice" and the gorgeous, blasphemous ballad "He Is". 2017's stopgap EP Popestar accelerated that positive momentum, thanks largely to the incessantly catchy single "Square Hammer", which topped the American mainstream rock chart. Undaunted by a tempest-in-a-teapot metal blog "scandal" that saw former band members launch a lawsuit against singer/songwriter Tobias Forge for royalties, exposing his identity as Papa Emeritus in the process – one of the worst-kept secrets in the metal scene – Forge and Ghost regrouped, hit the studio, and primed itself for a very big 2018. The result is Prequelle, a stunning fourth album that simultaneously builds on the winning formula of "Square Hammer" and "He Is", and at the same time shows a side of the band that few could have expected. For those who fell in love with "Square Hammer", Prequelle will prove immensely satisfying. "Rats" is a high-energy homage to the staccato riffing of '80s guitar greats Jake E. Lee and Vivian Campbell, while "Faith" immerses itself in the heavy flamboyance of King Diamond circa 1987, adorned with the kind of lead guitar flourishes we rarely hear in mainstream heavy metal anymore. "Witch Image" features pitch-perfect hard rock dynamics, the light and dark interplay rivaling the best work of Blue Öyster Cult in the late 1970s. And speaking of Blue Öyster Cult, "Dance Macabre" is a masterstroke of melodic hard rock expertise, a combination of the gloomy tones of "Don't Fear the Reaper" and the upbeat hooks of "Burnin' For You". One of Ghost's best characteristics is how Forge juxtaposes occult themes with contagious hooks (you attract more flies with honey than vinegar) and the line "I wanna bewitch you in the moonlight" is as good as pop metal gets. As strong as those immediate highlights are, the deeper cuts are even more fun to explore. The venomous "See the Light" beautifully captures the theatricality of Alice Cooper's "Steven", and staying with the Coop theme, "Pro Memoria" hearkens back to the psychodrama of "Pass the Gun Around" from 1983's DaDa. Literally translated as "Hell Window", instrumental track "Helvetesfönster" is an inspired mélange of Jethro Tull, the early '70s Alice Cooper band, and Opeth (Opeth's Mikael Åkerfeldt even contributes to the track) gracefully wending its way through movements both pastoral and foreboding. The real jaw-dropper, though, is the mesmerizing "Miasma", which starts off as a heavy metal version of Yes, including keyboard solos that soar into Rick Wakeman territory, quickly accelerating to a breakneck, '80s metal pace, only to have a saxophone burst in from out of nowhere, adding just the right amount of camp to the proceedings. That saxophone solo is the kind of wink to the audience that makes Prequelle so endearing: heavy metal has always been about camp, about gimmicks, and Tobias Forge is fully cognizant of the fact. There has been much hand-wringing of late among metal pundits about Ghost's marriage of pop, Satan, and image, but whether a metal band is about social justice, gore, Vikings, or wearing masks onstage, it is all a contrivance. It's all a means to stand out amongst the crowd, to sell records. Forge has always excelled at embracing that fact, but Prequelle is particularly special. It subverts metal clichés; it has a strong sense of history, but at the same time it searches for new ideas within that framework. Underneath the catchy melodies and snazzy artwork, Forge and his band have created one of the cleverest heavy metal records in recent memory.